I know this bugs Tim the most. He'll give me a sweet, sincere compliment and I'm too busy deflecting attention to appreciate the kind words. Blargh. I'm going to try to work on truly accepting compliments. Turns out people are kind of nice and want me to be happy. Fancy that! The workout was only 35 minutes but it was probably the hardest I've worked in my life. I ran a grand total of 6 minutes on the treadmill - and only for a minute at a time. But the speed was in between 9.5 and 10.3 each time. My legs got to experience sub-6 minute miles and they loved it. Shame my heart would stop after longer than 1 minute at that speed. Do you take compliments well? How do you deal with positive comments? I rarely just accept them. I think the best way to react is just "thank you." I'm curious - do you always return the compliment? I feel like I do that too, but it's not as genuine if people just repeat it back to you! Do you run faster/workout harder if someone is watching? Or if you're competing? Oh, heck yes. If no one is watching I don't see any reason to push myself THAT much. But someone looking over my shoulder at my speed at the gym? WATCH OUT. so true! oh my this week a lot of great folks have congratulated me on the marathon and I have down played it every single time! I am not at all good at accepting compliments! I am great at twisting them around into something bad or weird- the husband loves it ;). I DO run faster when I am running in my neighborhood and someone I know is driving by. My friend and I were just talking about that on our run this morning. I've learned to just say thank you when people compliment me. It took a while to get there though. I know where you're coming from. I definitely run faster when people are watching. Like if I run by a biker or another runner, I'll speed up. I've noticed a lot of women reject compliments like this! It makes me sad. I don't understand why we can't just accept them and say "thank you" -- but then again, I'm guilty of it too! Now I can't stop picturing you in a snazzy brown suit prosecuting bad guys with a DUN DUN occasionally chiming in the background. I know you enjoy my completely off topic comments. You're welcome. YES! You're response to "You ran a marathon" is pretty much my same answer..but I don't say it's not that hard. I definitely think it's hard, even for a pokey plodder like me. I'm exactly the same! Getting compliments makes me really uncomfortable! And, yes, I definitely work harder if I'm being watched. Nice job cranking the treadmill up so much! What a great way to get a workout in! Competing with the hubs is a great motivator. I deflect too. I think most everyone I know does. It is a good thing to work on. It isn't nice for it to be so hard to simply say, Thank you. I am the worst at taking compliments. Cannot even accept some after loosing 75 lbs. I say things like "but I was FAT!". drives my husband nuts. and yes for sure on the second question! I got pride! ha ha! it is like in a race I will never walk or slow down in front of my family or the pro photographers!!! Of course! I can NEVER slow down in front of the photographers! My husband gets so irritated with me when I can't accept a compliment! I'm horrible about that! Yesterday I met the daughter of one of my regular customers. Apparently he had mentioned to her the fact that I run (she does too), because she said, "So you're the athlete?" My immediate response was, "HA!!!!! That's being VERY generous." I am not all the great about taking compliments. It gets me all flustered and embarrassed. I am learning to take them more graciously though as I get older and say yeah I am pretty awesome. as are you so you embrace it and say THanks! i'm the same way with compliments. i think it's a girl thing! women do this all of the time. i noticed about a year ago that i was terrible at this and have been trying to make an effort to be curtious to others kindness, making baby steps. I am pretty sure that I start almost all of my replies with a Thank You and I have my mom to credit for that I suppose. I definitely run faster when someone is watching or Allan is running with me. He runs faster than me and I want to run at his pace even if it's too fast for me. A while back I started accepting every complement. I like an ego boost. If they didnt want me to be happy by the complement they would not give it. Too bad if they have to hear me brag because of it! That is fast! Nice job! I don't accept compliments well at all. I always brush them off too because it's like I always think they're just being nice and question if they really mean it. It's a tough habit to break. I am horrible at receiving compliments. I always deflect them! It is so stupid, but I feel funny getting compliments. I don't run faster when people are watching, but I do try to keep up with other runners that are obviously faster than me in races, super competitive! 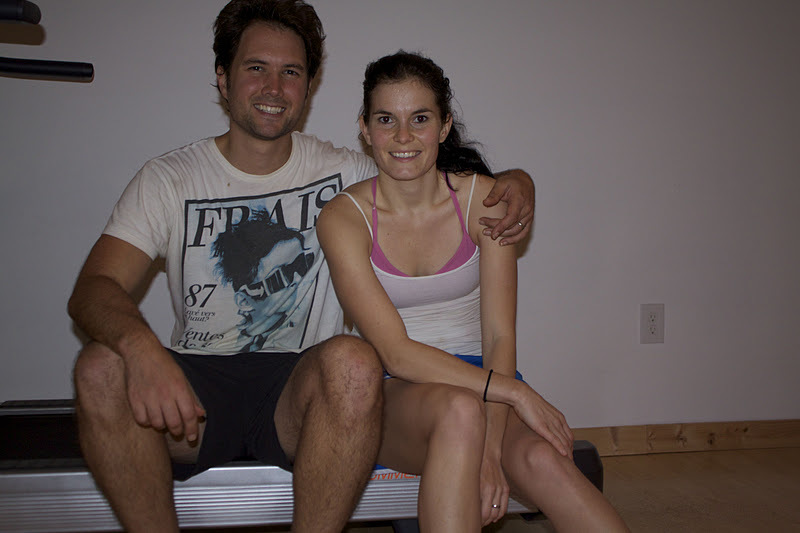 BTW, you are adorable post workout ;-) I couldn't resist! This is sort of related to the whole not accepting compliments thing. I've just recently noticed how much it annoys me how running bloggers are so self deprecating. Seriously, they are always putting their times down if it isn't a PR and it's so infuriating to me because it's about a million times faster than me so therefore I think I need to put myself down because obviously it isn't good enough and thus the cycle continues. I'm not saying disappointment can't be expressed or we can't expect more from ourselves, but I think we shouldn't be ashamed or put down our achievements and accomplishments. So good on you for working on accepting compliments. I think that is awesome! I have to say - I'm definitely guilt of self deprecation! I try to be just as positive about my achievements though. It's tough to find a balance of self-deprecating/arrogant! I do think I work harder when someone is watching! Accepting compliments is kinda hard. Its probably a girl thing. If its about appearances or what im wearing I get embarrassed and blush, smile and say "Thank You." But if it was something that I worked on that I put blood, sweat and tears into and someone complimented me. In my head I would be like "AWWWW Yeaaaaaaah!!!" fist pump! But in reality I would have a huge smile and say "Thanks." I love competition especially against guys because I always want to be as good as them and I run so much faster when people are watching me. I don't know why. I do the same thing with compliments, especially with my husband. And, yes, I totally work harder if someone is watching...I probably need to do that more often so I don't slack as much! I try to say thank you, but I find myself saying, "I run slow", or "this dress, it's so old, it was on clearence". I'm working on "Thank you"! Little miss speedy, wow! I never go that fast, even on a treadmill. Dang, I don't know if I can even run at 10mph...for a second. Great workout! Oh goodness, I am always saying sorry! In situations that sorry doesn't even fit! I do tend to put myself down a bit, but I am working on it! Nice workout girl. That totally rocks! I have such a difficult time accepting compliments.My husband hates this about me. I love your workout ideas- very creative. I enjoy running with a group but I am often reminded just how "slow" I am. I am so bad at accepting real compliments too, I will either do what you do or change it back to the person giving it. Gah. And I'm always better when im training with someone else, or the trainer is on my shoulder - and if I'm wearing my heart rate monitor beware anyone that burns more calories than me. Sometimes I think it's hard to take compliments because you don't want to be seen as proud or vain. It's something that I need to work on too! I used to take compliments exactly as you described and I would more often then not get lectured about how I just need to accept the compliment and believe it. I got tired of the lectures so I have REALLY been working hard for the last few years to accept compliments better (and by the way - you actually said that running a marathon was "not that hard" - WHAT!). I definitely bring my A game when someone is definitely watching or even if there is a good chance someone may watch. NUTS huh! You two are super cute couple! Love it that you include Tim in your blog/video. I seem to always downplay compliments too. Today a teacher complimented me on my outfit and instead of saying thank you, I said something like "oh, I needed to do laundry, that's why I have this on today." I need to just learn to say "Thank you!" i downplay compliments all the time. On another note... I think its utterly awesome how your hubby is getting so involved with picture taking and vlogging- great show of support. Anyway, agree w/ you on compliments. I get uncomfortable too and do the same as you. Working on just saying Thank You lately! Great workout! I dream to be able to be that fit one day! !